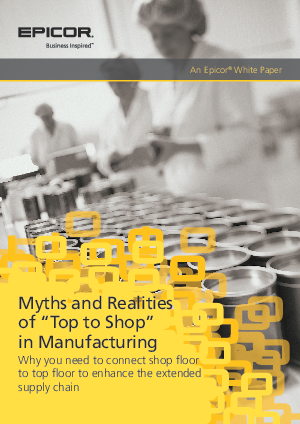 For nearly two decades analysts, journalists, and industry experts have warned manufacturers about the consequences of a disconnect between the shop floor (the production line) and the top floor (senior management up to C-suite). With all that has been written on the subject, it is surprising that few manufacturers have even tried to connect the shop floor to the top floor to enhance the extended supply chain. Those that have taken action without success failed to address the fundamental requirements of connecting the top floor with the shop floor in a manufacturing business. Making the connection from top floor to shop floor, and back again, can seem overwhelming. Like any strategic goal, it requires senior management commitment, together with motivating and mobilizing everyone and everything throughout the organization in the same direction. Without this level of commitment, information silos flourish and the disconnect becomes a chasm, placing business goals in jeopardy.